The thing that is hardest to me about Michigan winters isn’t the ridiculous amount of snow (60 inches just in December and January) or the biting cold. It’s those interminable grey skies. November to April seems like one long streak of grey, and though I like grey as a color (quite a lot, actually) I do not like it as a sky. So when a single skein of happy yellow Malabrigo beckoned to me from a shelf at my local yarn shop, how could I resist? 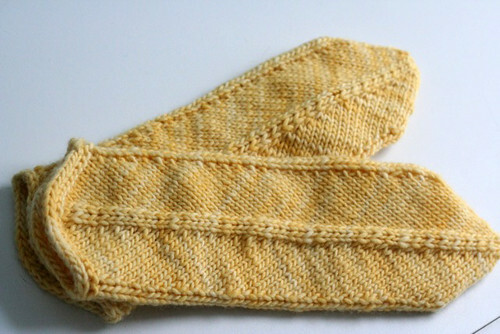 Still, these are great little mitts and I will definitely be making more. These make great gifts, or a super-fast indulgence for oneself! Really cute! A lovely spot of sunshine. Yeah for grellow! 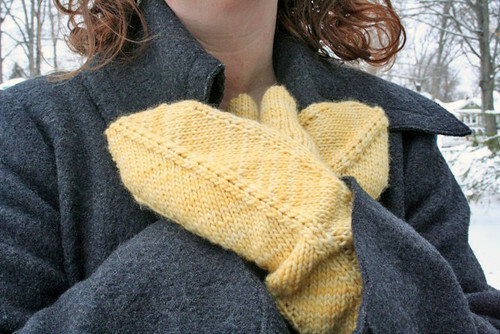 I wish I would have made these mittens out of Malabrigo and NOT Noro–the softness is key with these, right? These turned out so beautifully- I love them! And the grellow…goes without saying…awesome! 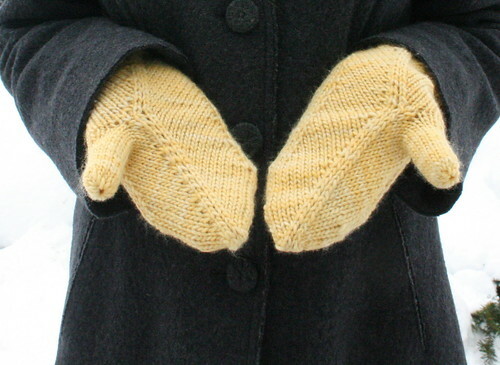 There’s a neat mitten pattern in the little Vogue “Mittens on the Go” you might like….they use the Feather and Fan pattern and I think are knitted from the top down, and they always remind me of these Mitered Mittens. I’ve been wanting to make both. I wish my library had some EZ knitting books! Those are super cozy. What a wonderful ray of sunshine! I heart these!! Yellow is so happy. Beautiful! Your mittens are so sweet! The lemony yellow works perfectly. I’ve just knit that pattern as well, and LOVE mine!! I totally need to more pairs — I love the way that it is easily resized as well. What a great pattern. Pollen- what a great name for that color! Love the colour! 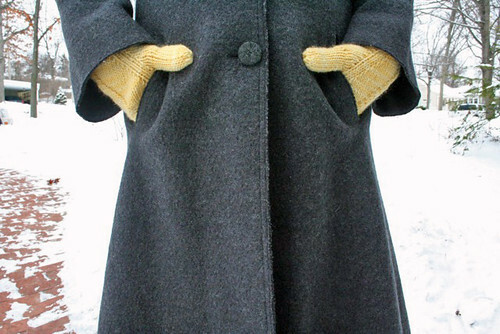 And especially with the cozy grey wool of your coat — lovely!